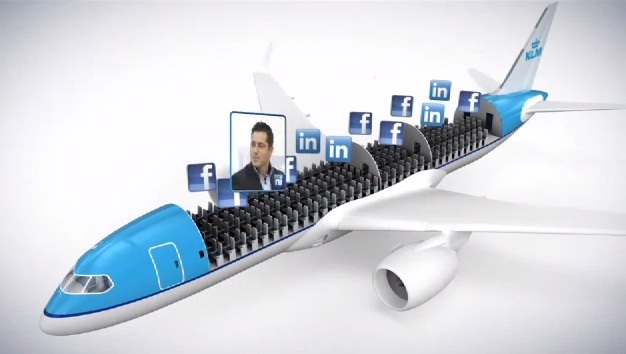 A new 'Meet and Seat' initiative by Netherlands-based KLM Royal Dutch Airlines enables you to login using Facebook or LinkedIn after buying your seat ticket. Using their site, you can then look to see who else will be on your flight, allowing you to view other passengers’ Facebook or LinkedIn profile details 'and see where they’ll be sitting – long before your flight leaves the ground'. The idea is that you get the chance to see who might be worth meeting, so you can start chatting to them before you even get to the airport. At present Meet and Seat is only available on KLM flights between Amsterdam and New York, San Francisco and Sao Paulo, and from 90 days until 48 hours before departure, but the airline say they'll be adding it to more flights soon. Personally I think it's a bit creepy, but it's certainly an interesting social media campaign.